Mala Beads Necklace handmade of 108 natural Howlite (White Turquoise) gemstone beads. Genuine White Howlite gemstone Mala Beads Necklace. 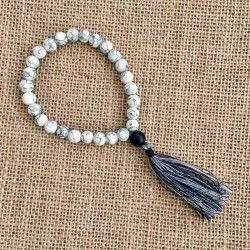 Use this Natural Howlite Mala to cleanse and stabilize your inner being by removing and/or transforming negative energy.